Wood, Frank Watson (1862-1953). Watercolour signed and dated 1929 (LR) and annotated "The Mauretania berthing at Southampton" (LL). In all Cunard's 175 years there has been no more famous Cunarder than the “MAURIE”, a ship that ruled the roost during the most prestigious decades of the express service on the North Atlantic run of the early 20th century. The strikingly fine lines of the two sisters, MAURETANIA and LUSITANIA with their beautifully balanced appearance, tall funnels and elegant counter sterns, revolutionary steam turbines, sustained high speed, excellent sea keeping qualities and luxuriously appointed public rooms and accommodation ensured that they quickly became popular with the Great and the Good who travelled this route. They weren’t disappointed with the ships' time-keeping either: very early in MAURETANIA's career in September 1909 she covered the distance between Daunt’s Rock and Sandy Hook at an average speed of 26.06 knots, a record which would remain unbeaten for 20 years although had LUSITANIA not been torpoedoed in 1915, who knows what sort of competition between the two sisters wouldn't have managed to raise the record to even higher speeds! During WW1 MAURETANIA was pressed into service in 1915 as a troopship and served in the Gallipoli campaign; she was then converted into a hospital ship, her commodious public rooms offering impressive space for stretcher cases and cots and her high speed ensuring that she was greatly valued in this role. As the war’s end approached she reverted to being a trooper before being returned to her owners in 1919 when, refurbished and repainted, she returned to the North Atlantic run, her popularity if anything further enhanced by her gallant war record. But by the end of the 1920s she was getting no younger and was increasingly pressed by newly built and more modern upstarts; and soon after this watercolour was painted in 1929 she embarked on her third career and she was employed on cruising voyages where her white hull allied with those impossibly tall cadmium red Cunard funnels ensured she was a distinctive sight as she breezed elegantly around the Caribbean delighting her passengers. 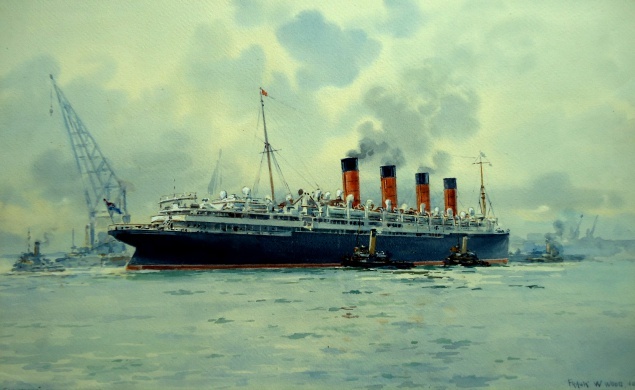 To huge public sadness, MAURETANIA's end came in 1935 when she was taken out of service. With her masts cut down to allow her passage under the Forth bridge the proud old ship, head unbowed to the end, steamed herself to the breakers at Rosyth, Scotland, even it was on reduced boilers! Her glorious 28 year career was over and with her passing Cunard lost one of its most lustrous jewels.